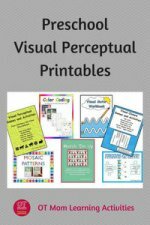 These printable visual perceptual worksheets can be used to supplement hands on activities as part of your child's visual perceptual development. This page describes the skills that each e-book covers and/or some tips that I found helpful in using these workbooks with my own kids at home and in therapy situations. If you are at all concerned about your child's visual perceptual skills, please request an occupational therapy evaluation. Use of the visual perceptual worksheets on this page is NOT a substitute for occupational therapy intervention! There are worksheets that require figure-ground perception and visual closure. 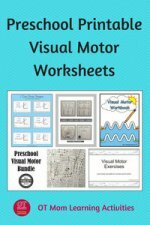 There are quite a few worksheets that practice visual-motor skills. If your child has poor pencil skills: he/she can point out the answers, or trace with their fingers. This is a worthwhile download that deserves laminating to be reused over and over again! 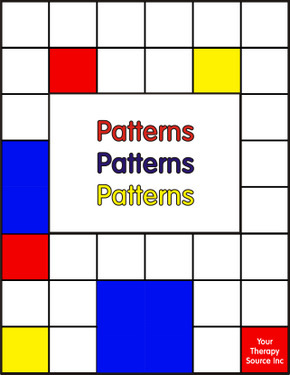 There are 20 reproducible Graphing Games (10 themes containing 2 graphs each) in lovely detail that can be used to promote math skills, form constancy, visual closure and visual discrimination skills. Printing: These activity pages deserve to be printed in color (and laminated), but can be used in black/white to increase the visual perceptual skills challenge. Included in all the Visual Perceptual Bundles at a 30% discount! I LOVE this ebook! Suitable from kindergarten. There are 20 totally different sets of pictures that are presented in the same format - which is a set of small cards that need to be cut up (by child or parent) and then matched to the main set of pictures. The idea is that the child races against a timer, but this is optional - I prefer to let a younger child work without a timer, but older children may like the timed challenges. Depending on the puzzle, the child uses visual discrimination, visual closure, figure-ground perception and/or position in space skills. Printing: it is worth printing these in color and laminating them but printing in black and white simply adds to the visual discrimination challenge and works well. 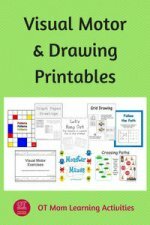 A set of 24 worksheets. This is a set of 24 puzzles that follow the same format: the child has to scan the grid and cross out the item (letter, number, image) that occurs more than once. Although the same format is followed, the pages cover a variety of themes..
To complete the task requires some planning skills as well visual memory (holding the latter/number/image in your head) and visual discrimination (scanning the sheet for identical objects). The puzzles also reinforce the skill of visually scanning from left to right. I recommend you sit opposite your child to make sure that the visual scanning is happening correctly! The letter grids produce a secret word made up of left-over letters, the number grids give you the number of seconds/repetitions for which an exercise must be done, and the image puzzles produce a brief exercise or hand-muscle routine to be done using the remaining images. A fun concept! 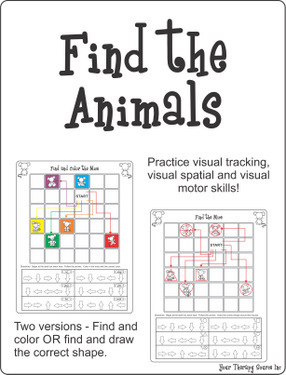 Work on directionality, visual motor and visual tracking skills! Beginning on the specified "start" box, kids need to follow the arrows to find the animal and then either color the animal, or put a specified shape around it. Really nice way of working on directionality and spatial orientation skills. The visual motor demand comes from keeping the path of the pencil within the boxes. Visual scanning and tracking skills are also brought into play as your child scans ahead to count the blocks and direction in which to travel. Increase the spatial orientation challenge: Cover up the arrows at the bottom and then give your child the verbal instructions (eg "move two blocks to the left"). Your child won't have the visual clues of the arrows to help, and will be using more spatial orientation. Increase the auditory memory challenge: Cover up the arrows as above but give your child two or more verbal instructions at a time, (eg "move two blocks to the left then one block down"). Great for visual discrimination and figure-ground perception! 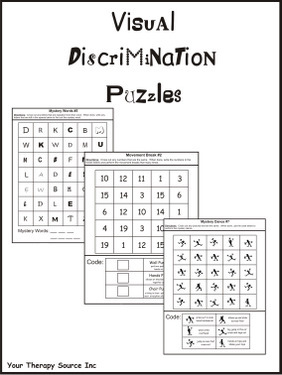 This booklet contains 15 worksheets that work on visual discrimination and figure-ground perception. 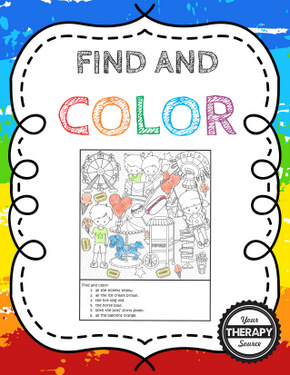 These visual perceptual worksheets have a shaded, slightly patterned background, filled with white figures and objects that your child needs to find and color according to the instructions. The instructions can be read out loud by a parent or by the student themselves. A typical instruction might say "Color all 6 stars yellow" or "color the parrot int he tree red". 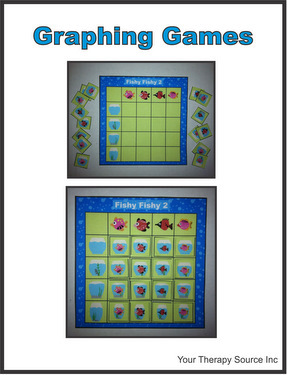 The worksheets come in a variety of themes that will suit both boys and girls. 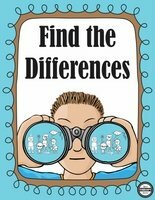 This is a great little resource for figure-ground perception, visual discrimination and visual scanning! The activities are presented in 2 different ways. In both, your child is presented with a piece of a monster and needs to pay attention to small details in order to find the monster which matches the piece. The colour format makes it a little easier to differentiate between monsters. 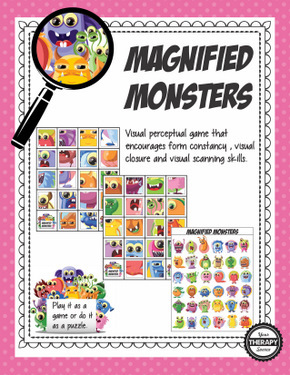 You can increase the visual discrimination demand by printing in black and white, which reduces the "clues" given to your child and will force your child to pay close attention to spot the tiny details to identify the exact monster. Help your child to pay attention to the small details such as the shape of the tooth, the style of "hair' in the background, etc, in order to differentiate between similar looking monsters. Printing: Color printing is recommended for easier challenges. You can print in good quality black and white to increase the challenge for older kids. You may reprint this resource as often as you need to. Encourage figure-ground perception, visual discrimination and visual scanning skills. 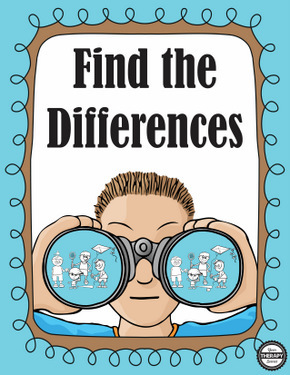 These standard "find the difference" pictures, covering all kinds of themes, are ideal for younger children or for those who struggle with figure-ground perception or visual discrimination. The pictures are clear, not too detailed, and there are just 5 differences between each picture. I really like the simplicity of the black and white line pictures, which enable the child to focus on finding differences without being overwhelmed with details. A fun back-to-school theme that can be used any time of year! 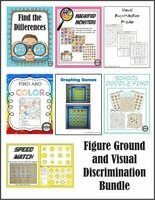 This set of visual perceptual worksheets works on visual scanning, visual tracking, figure-ground perception and visual discrimination skills. The activities are presented in a find and color and a game board format, and can be used one-on-one or in an activity station. If you want to work specifically on the visual tracking and scanning aspects of the worksheets, I recommend you sit opposite your child and show him/her how to track across the page, using a finger to guide the eyes. If this is too hard, cut a "window" in a piece of cardstock to help your child focus in just one area at a time. Printing: Color is best, but B&W can increase the challenge for older kids. You may reprint this resource as often as you need to. Work on your child's visual memory and/or auditory memory with this download! Although the sheets come with space for your child to write the answers, you can easily do this verbally with your child and ask your child to TELL you what he/she remembers. Or print a duplicate sheet, cut out the objects and ask your child to point out the remembered pictures. There are 3 different kinds of sheets, which can be used in different ways to vary the demand for your child. There are 5 black and white sheets that contain line drawings that are easily identifiable and should be familiar to your child. Then there are sheets that contain 12 coloured pics around a theme (eg fruit). Try to choose a theme with which your child is familiar (eg don't use the fruit sheet if your child is unfamiliar with the different fruits). I personally found the pictures to be a little abstract (and therefore potentially hard to identfy), but if you use a duplicate sheet which is cut up, your child can point out what was seen instead of verbalising. The third set of sheets contain "memory boards" - sheets that are filled with a variety of small, colorful, unrelated objects. The idea is that your child study the sheets and then tell you what he/she can remember seeing. There are quite literally hundreds of objects on each memory board, so you can make it easier by cutting or folding the sheets to show your child just one part at a time. Printing: Color is best. Although the second set of sheets is in black and white, the first and third sets need to be printed in color for best results. You may reprint this resource as often as you need to. 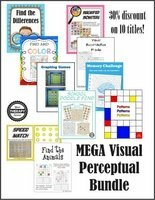 Visual Perceptual Worksheets Bundle Deals! Get a 30% discount on individual titles when you purchase a bundle deal! Use a selection of worksheets and activities from different e-books each week to hold your child's interest. 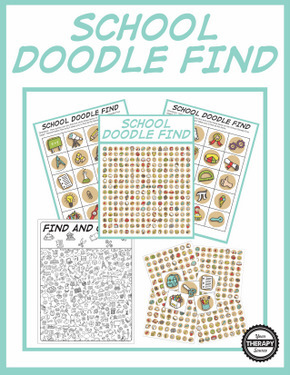 Remember, once you have purchased these, you can reprint the resources as often as you need to, for use with all your children! 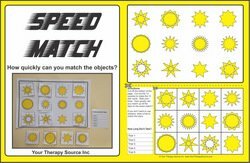 Check out these other pages on my site that offer different printable visual perceptual worksheets and resources. If your child struggles to complete the visual perceptual worksheets, consider seeking an occupational therapy assessment to get to the bottom of the issues. 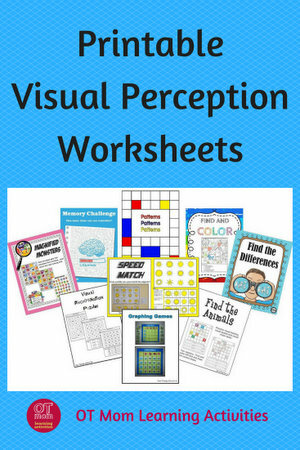 I hope that you will find these visual perceptual worksheets as helpful as I did! I used them with my own kids as well as those I saw in occupational therapy practice.